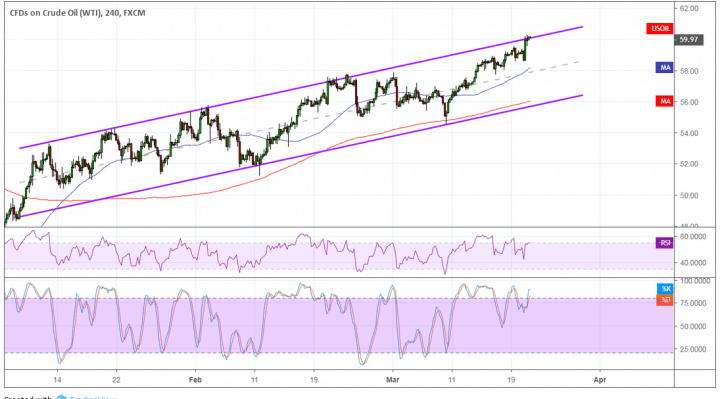 WTI crude oil continues to test the top of its ascending channel on the 4-hour chart and might be due for a break above it. If that happens, price could stage a steeper uptrend. The 100 SMA is still above the longer-term 200 SMA to confirm that the path of least resistance is to the upside. In other words, the climb is more likely to gain traction than to reverse. The 100 SMA lines up with the mid-channel area of interest to add to its strength as support while the 200 SMA is at the bottom of the channel around $56 per barrel as the line in the sand for a pullback. RSI is pointing up but is close to the overbought zone, which suggests that selling pressure could return soon. Stochastic is also in the overbought region to signal that bullish momentum might fade and that bears could take over. A candle closing above the $60 per barrel mark, however, could spur a sharp rally next. Crude oil dipped slightly on the Fed’s not-so-upbeat outlook shared during the FOMC statement this week as expectations of a global slowdown could weigh on commodity demand. However, price rebounded quickly as this also meant lower interest rates for much longer, which would be encouraging for businesses. Besides, another surprise crude oil draw eased oversupply concerns as the API reported a reduction of 2.133 million barrels for the week ending March 15 versus expectations of a 339K build. This could mean that the EIA data would likely show another large draw for the week as crude oil stays in demand while US shale oil production dips. Keep in mind that the OPEC output cut and supply disruptions in Venezuela, as well as US sanctions on the country, are keeping a lid on global crude oil supply.